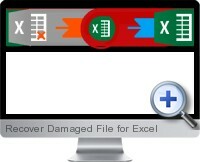 Recover Damaged File for Excel (Recovery Toolbox for Excel) is a fast and reliable solution to recover damaged and corrupt Excel files. The application can recover damaged files for all versions of Excel from Excel 97 to Excel 2010 and files formats including XLS, XLT, XLSX, XLSM, XLTX, XLTM and XLAM. Recover Damaged File for Excel displays a report on the data and information recovered and creates a new file leaving the original file untouched. The robust solution can be used to prevent valuable data loss and save time recreating file content. All cell data within the workbook. Column widths and row heights. All types of formula including functions, internal, external and name references. Cell formats (font, number format, line style, fill pattern, text orientation and alignment). Cell color fills and border styles.